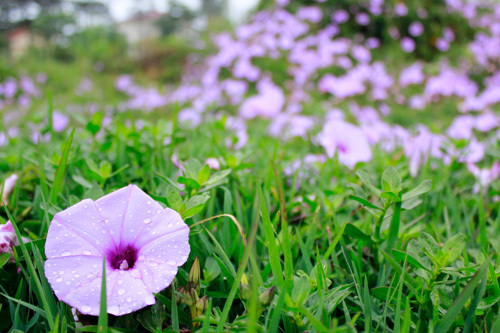 Ipomoea aquatica goes by many names around the world! 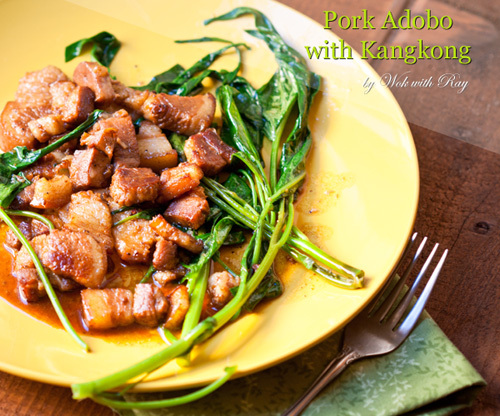 Water Spinach is a common vegetable in Asian cuisine. Water Spinach has spinach-like leaves and hollow stems. My first experience with this plant was in the Asian supermarkets while I was living in Minnesota. I was very curious about it, but it took many trips before I got up the nerve to sample the bright green leaves. I had no idea what the vegetable was called, but it was quite good. It came as no surprise when I heard it called Water Spinach, as it really does taste like “regular” spinach; althought Water Spinach has a bit nuttier taste. While the plants I normally highlight on this site are perennial and well suited to cool or cold climates, I do make exceptions for exceptional plants, and Water Spinach (or Kangkong) is one of them. 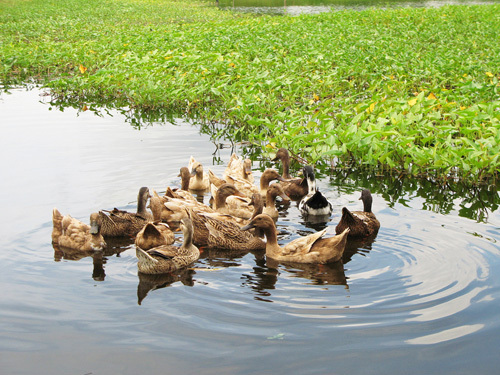 It is common in Southeast Asia and grows with almost no care in many waterways. 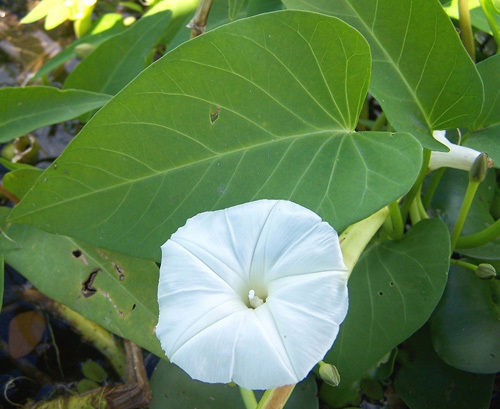 Unfortunately, because it grows so easily, it has been named an “invasive” in many parts of the United States. In warmer locations, it can be grown as a perennial. In cool to cold locations, it can be grown as an annual or as a greenhouse plant. It grows so fast and easily, and tastes so good, that I think everyone in a Temperate Climate should be growing this plant indoors in the Winters and outside in the Summers. 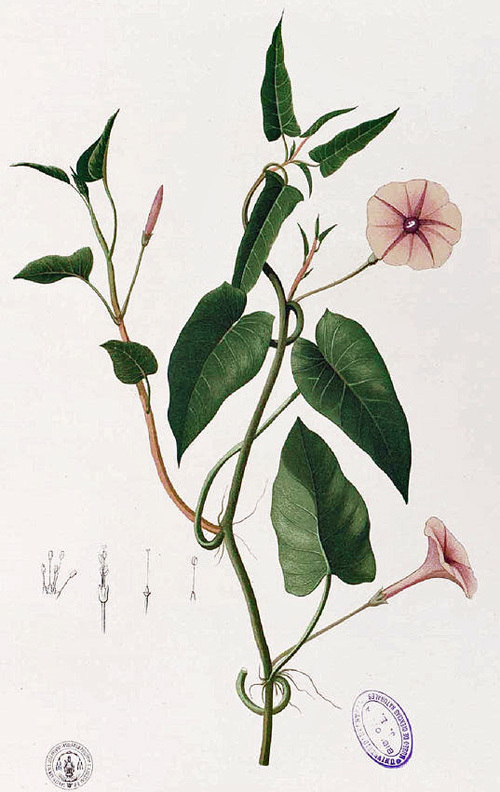 Botanists are unsure where Water Spinach originated, but it likely came from somewhere in eastern India to Southeast Asia. It was first documented in 304 AD with the Chin Dynasty in China. Currently it is found throughout tropical and subtropical regions around the world, but is a common ingredient in Southeast Asian cuisine. Red-Stemmed Water Spinach has pink to purple flowers. Water Spinach has two major forms: Red-Stemmed (with pink to purple flowers) and White-Stemmed (with white flowers). 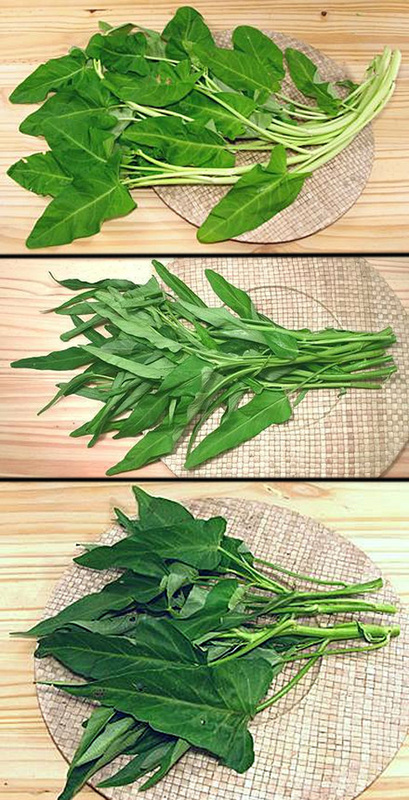 White-Stemmed Water Spinach as a number of cultivars that can roughly be categorized as long-leaf (or narrow-leaf), broad-leaf, white-stemmed (pak quat), green-stemmed (ching quat), etc. There is no formal classification that I can find. Some consider the white-stemmed variety (pak quat) of the white-stemmed form as better tasting than others. There is growing research showing that the red-stemmed form has more health benefits. Each variety and cultivar has different culture characteristics as well… some can grow in moist soil, while others need to grow in water, and some can grow in both conditions. Water Spinach grows fast… up to 4 inches (10 cm) in a day! Water Spinach stems are hollow and can float. Water Spinach will root at the nodes on the stem, and these roots can establish new plants if the stems break. Water Spinach usually likes full sun, but can be a great herbaceous groundcover in very hot locations. 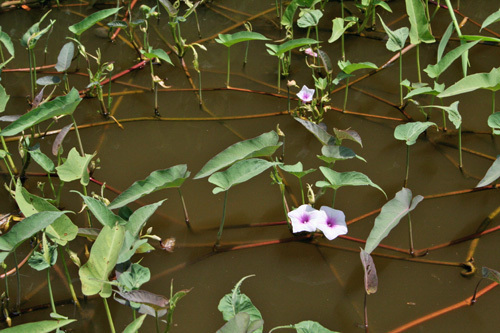 Water Spinach is considered an invasive weed in the United States. But almost no one is eating it! 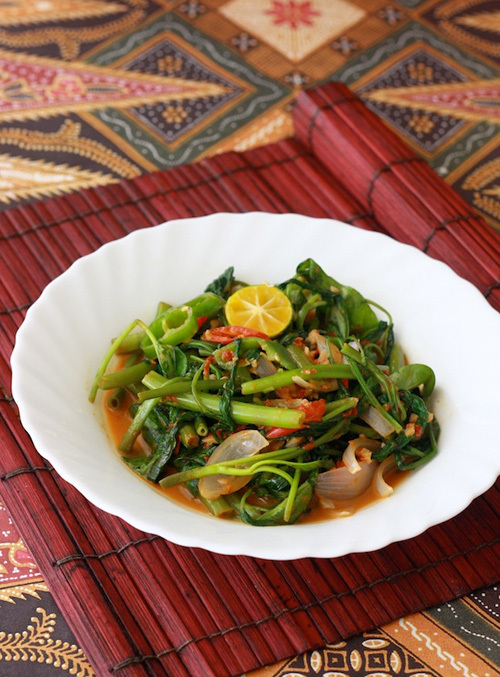 Sambal Kangkong: This dish looks amazing! 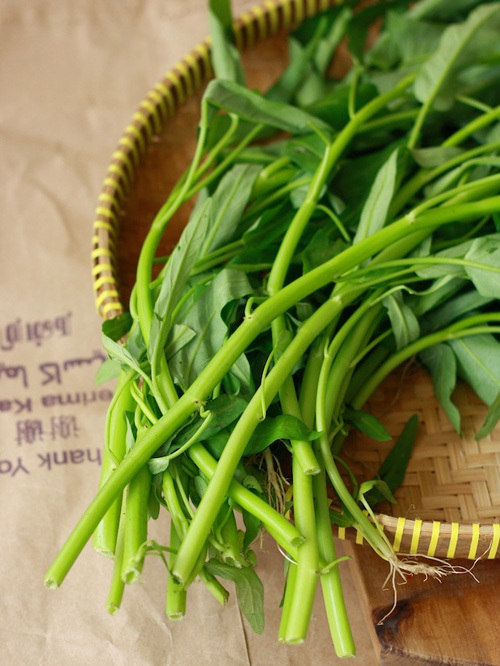 Edible Shoots – typically only the young and tender shoots are eaten, usually cooked. Edible Stems – typically only the young and tender stems are eaten, usually cooked. These stems are hollow and are crunchy when cooked. The stems require only a little bit longer cooking time than the leaves. Water Spinach also makes great fodder! 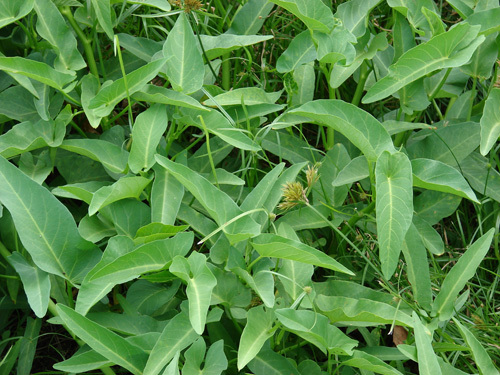 Animal Fodder – older leaves and fibrous stems are used as animal feed in tropical climates. But in any area where this plant is growing too fast, it would make a great ancillary feed source. Harvesting: Best harvested before flowering. Often harvested 30-60 days after sowing, depending on climate and culture – earlier if fully aquatic and later if semi-aquatic. 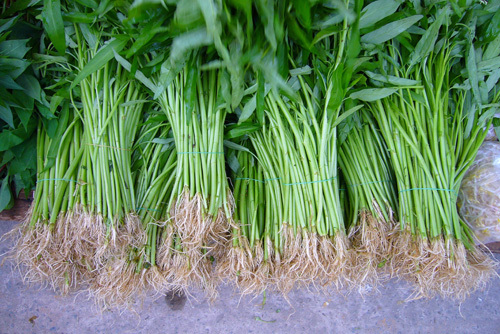 Water Spinach can be harvested completely or in a cut-and-come-back-again manner – secondary shoots will form and grow. Harvest in the coolest part of the day to prevent moisture loss and wilting. Storage: Water Spinach is very perishable… it does not store well. It only stores well in the refrigerator for about a day, but occasionally can make it 2-3 days. This is why we should grow our own! 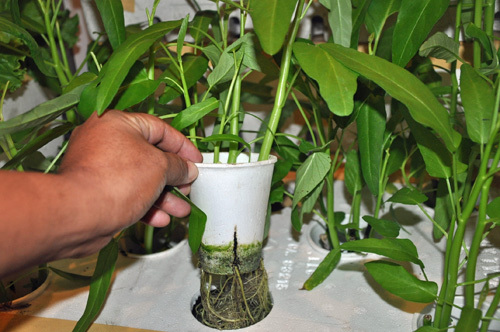 Water Spinach does very well in hydroponic systems. 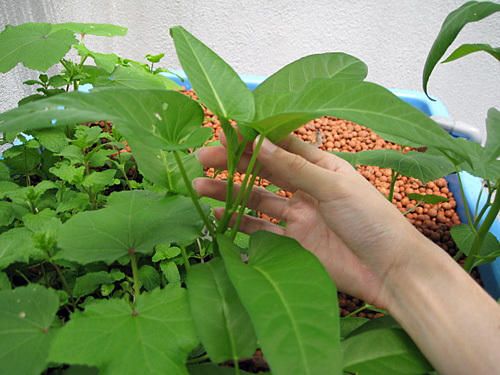 Water Spinach can grow in dense mats. USDA Hardiness Zone: Zone 8-15 (as a perennial). Water Spinach does not do well where average temperatures drop below 50 F (10 C), and do much better when the temperature is between 68-86 F (20-30 C). For most of us living in a Temperate Climate, this means we will use Water Spinach as an annual or grow it in a greenhouse. Chill Requirement: Unlikely, but no reliable information is available. Leaf Type: Perennial in warm climates. Annual or greenhouse plant in colder climates. Cultivars/Varieties: There are a number of varieties available for this plant. Life Span: No good information available. Considering that the plants grow so fast and can be propagated from cuttings so easily, an individual’s life span is likely irrelevant. 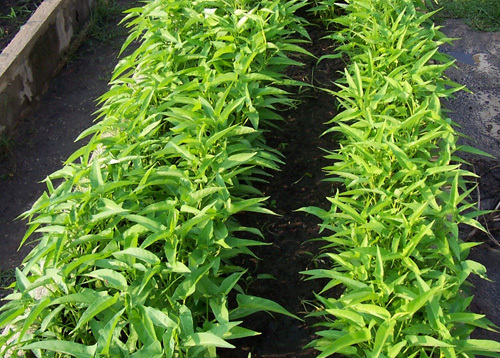 Some varieties of Water Spinach can be grown in moist soil conditions. Size: Up to 12 inches (30 cm) tall with trailing stems that are 7-10 feet (2-3 meters) long, but can get to almost 70 feet (21 meters)! Roots: Fibrous. Stems can root at the nodes. Water Spinach roots very well from cuttings. Geoff Lawton showing his floating island of Water Spinach. If you live in a warmer climate, consider the fast-growing nature of this plant. 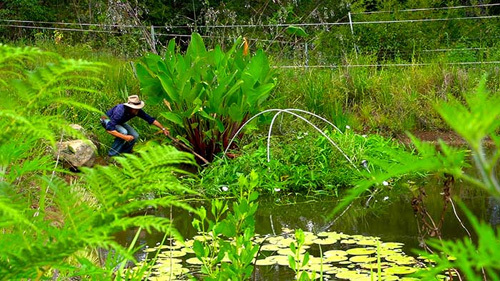 Since this is an aquatic or semi-aquatic plant, there is always the question of how to grow it in water. Briefly, the seedling or rooted cutting is placed in very wet soil. This can be “puddled soil” like a rice paddy or at the pond’s edge or in a floating island (like Geoff Lawton) and allowed to grow into the water from there. See Propagation section below. Can be grown from seed, often soaked for 24 hours before sowing. Can be easily propagated from cuttings just below a node; Water Spinach freely roots at the node. One source explains that commercial operations will take cuttings approximately 12 inches (30 cm) in length (which will have 7-8 nodes) and plant them 6-7.5 inches (15-20 cm) deep. Minimal. You may need to keep it from spreading too much if you live in warmer locations. Harvesting for human and/or animal consumption is the best method, by far! When eaten raw in Southeast Asia, there is a chance it can carry the parasite Fasciolopsis buski, the largest intestinal fluke in humans… it is best to cook it if in this area of the world! Listed as an Invasive in many places, especially in the United States. It is illegal in some parts of the United States to even be in possession of it! Please check with your local state laws!